Office buildings are typically comprised of perimeter zones extending 12 to 18 feet in from the outer wall that usually include large glass areas and interior zones (that typically require cooling only). The perimeter zones require both cooling and heating and can have widely varying loads due to changing sun position and weather. For instance, one area or side of the building may require cooling, while adjacent spaces may simultaneously require heating. Office buildings may also have a wide variety of tenants with divergent energy needs. 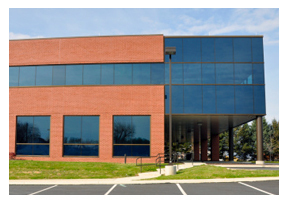 An office building can house stores, restaurants, fitness centers, radio or television studios, medical offices, printers, and computer centers, each with different operating hours and occupancy levels. Design occupancy levels can vary from 20 square feet per person for conference space and waiting rooms, to 75 square feet per person in clerical areas, or as low as 200 square feet per person in some private offices. Obviously, weather, occupancy, lighting, and floor loads (computers, printers, copiers, and other office machinery) are the big energy users. However, building shape, design, and orientation can also have a major effect on energy use. Even the type and placement of any trees surrounding the building can have an impact. Office buildings usually include both peripheral and interior zones. The peripheral zones usually have large window areas and may be considerably subdivided. These zones have variable loads due to changing weather and sun position, and typically require heating in winter. Especially during spring and fall, one side of the building may require cooling, while another side requires heating. The interior zones usually require a fairly uniform cooling rate throughout the year, because their thermal loads are derived almost entirely from people, lights, computers, and other office equipment. However, the cooling loads can vary from full to low or no-load conditions, so interior systems might utilize variable air volume (VAV) control. Office building occupancy schedules can vary widely, but most are occupied only on weekdays from approximately 8:00 a.m. to 6:00 p.m.. But it often varies depending on the occupation and work habits of the tenants, so some tenants may require night work schedules. Some office buildings include spaces that operate 24 hours per day, such as television or radio studios, printing operations, communications and computing centers, and certain restaurants. Therefore, for the sake of economical air-conditioning design, the intended uses of an office building must be well established before the type of system is selected and design is begun. Occupancy can also vary considerably. For instance, in clerical work areas, the density can be as high as one person per 75 sq.ft. of floor area; however some private office densities may be as low 200 sq. ft. person. The occasional waiting room, conference room, or board room can have occupancies that range from one (1) or two (2) square feet per person up to 20 sqare feet per person. A major part of the total cooling load is the lighting. In an office building the lighting and normal "floor" (equipment) electrical loads typically average from two (2) to five (5) watts per square foot. However, architectural or other considerations may make them considerably higher. Buildings with computer systems and other electronic equipment can have electrical loads as high as 5 to 10 watts per square foot. As these loads are critical to owner satisfaction, a careful estimate should be made of the amount, size, and type of computer equipment anticipated for the life of the building. This will help to size the air-handling equipment properly and provide an allowance for any future changes in the air-conditioning equipment. In high electrical loading areas, consider using exhaust air or water tubing to pick up the heat at the source. About 30% of the total lighting heat put out from recessed fixtures can be picked up by exhaust or return air and therefore, should not enter into the cooling supply air requirements. 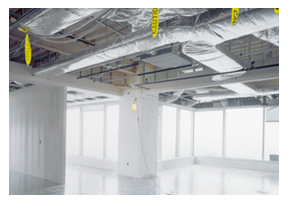 A suspended ceiling is often used as a return air plenum with the room air drawn through the light fixtures into the space above the suspended ceiling. In the end, the balance of the cooling load should include allowances for any miscellaneous load factors (i.e. fan heat, duct heat pickup, duct leakage, and safety factors), none of which should exceed 12% of the total balance. The variety of functions and range of design criteria applicable to office buildings have allowed for the usage of almost every available air-conditioning system imaginable. However, low-rise and smaller buildings typically use unitary equipment, such as packaged combination roof-top conditioners (gas heat/electric cooling or heat-pumps), often one unit per zone. Others use multi-zone units. In climates with low heating requirements, perimeter radiation, often electric, combined with conventional cooling units may be more economical. Still other buildings may opt for individual units, one per zone, ranging from the low-cost packaged terminal units (PTAC) or heat pump (PTHP) units to water-loop water-to-air heat-pump systems. Recent innovations and attention to reducing energy costs have led to the increased popularity of geothermal heat-pump systems. High-rise office buildings typically use central chilled/hot water systems with perimeter fan-coil units, or water-loop heat-pump systems. Where these systems have been installed for the perimeter zones, separate all-air systems (usually VAV systems) are typically used for the interior spaces and to supply perimeter zone ventilation. A perimeter heating system separate from the cooling system may be preferable for some office buildings, since the air distribution devices can then be selected for a specific duty, rather than as a compromise between heating and cooling performance. If the higher cost of additional air-handling or fan-coil units and ductwork is a factor, the designer may consider less expensive options, such as fan-powered terminal units with heating coils for perimeter zones in lieu of a separate heating system. In climates with low outdoor winter temperatures, under-the-window perimeter radiation (hydronic or electric) may increase occupant comfort by offsetting downdrafts. System flexibility is essential, because office procedures are constantly being revised and basic building services should be able to meet changing tenant needs. For single-owner or leased buildings, the system may be designed without the degree of flexibility needed for a multi-purpose building. Owner-occupied buildings may require considerable design flexibility, because the owner is more interested in the life-cycle costs, usually wants quality and will pay for it, and anticipate future alterations. The speculating builder wants low first cost, is typically not interested in life-cycle cost, and generally charges alterations to tenants. Tenants that have hours of occupancy or design criteria that differ significantly from those of the main office building (such as data processing centers, stores, banks, restaurants, and entertainment facilities) may need to have their own systems. While office buildings are typically designed to minimize outdoor air usage, recent attention to indoor air quality may dictate higher levels of ventilation air. Regardless of the situation, the minimum volume of outdoor air should be maintained in variable volume air-handling systems at all times. Dry-bulb- or enthalpy-controlled economizer cycles should be considered when trying to reduce energy costs. When an economizer cycle is used, systems should be zoned so that energy waste will not occur by heating outside air. This is often accomplished via a separate air distribution system for interior and major exterior zones. Other energy saving opportunities include consideration of thermal storage to reduce demand costs and equipment size, and geothermal heat pump systems are an energy saving and "green" alternative. Water heating in office buildings is not a major energy user as application is typically limited to restroom use (washing hands, etc.) by the occupants and night-time use by the cleaning crews. Any needs for specialized users (food service, photo processors, etc.) must be treated separately. Service hot water in office buildings is typically heated using electric- or gas-fired storage water heaters. If a boiler is used it should be separate from the main heating boiler. Convert gas heaters to off-peak electric with adequate storage. If tower water is available year-round, consider a water-to-water heat pump. Small offices don't typically have cooking facilities; however, larger offices may be equipped with cafeteria-style cooking and dining opportunities. 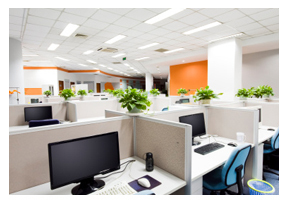 Office building lighting typically uses fluorescent fixtures set in suspended ceilings. Other fixtures consist mainly of exit signs and possibly some emergency lighting in otherwise dark hallways. Lighting efficiency improvement is the simplest energy saving strategy for commercial and industrial facilities. Lights typically consume 15 to 40 percent of the annual energy usage for most buildings and are usually less expensive to change than other energy systems.